Had my open tutorial with Louise Scullion who was kind enough to take the time out to speak with me about my project concerning nature. Louise's work has focused a lot on the natural world in the past so she seemed the right tutor to discuss the project about. I felt very comfortable discussing my ideas with her and she opened up a lot of different views on the subject of trees and the natural world. I showed her my research so far as well as the materials I had been collecting and my photography. We talked about the chemical reactions of trees and how they process and work on the insides and how theirs a silent type of battle going on within the natural world. Especially inside trees since so many species rely on them as homes, shelter and resources. We also discussed trees and their place in the world and the type of aura's they admit and how ancient they are. And also the different ways I could manipulate the materials I already have found and how I could use them. Also as humans we try to find relationships with everything because of our empathy and try to relate and create stories about things even if their not human. This subject is touched on greatly in Mike Greens article about our relationship with nature post I did. That's probably why for this project I have been trying to match the human figure with trees but I'am open to look into other perspectives about this as well. Funnily enough Louise started to mention musicians a lot that had a lot to do with natural elements and they were actually two of my most favourite artists that I've enjoyed for a long time. One was the singer and performer Björk who I've been a fan of her work a for many years and is an artist who uses a lot of surreal and abstract imagery in her work. She also breaks boundaries of music by using unconventional sounds into her songs as well as using unique singing techniques. She tends to use a lot of themes of nature and animals in her work especially her music videos and quite primal human emotions. Her first music video as a solo artist was about human's and the natural world and how strange and wonderful it is. This music video directed by Michel Goundry has a lot of visuals of landscape and points meanings to the human body and it's place and relationship within and with landscapes. Another music video using the theme of human form and nature a lot more tribal with interesting visuals. Another band Louise brought up which made me really happy was Cocorosie and their a band I've been a huge fan and influence on me in the last few years. They are two sisters who formed a band together and their music is described as 'freak folk' and their sound is very unique. They used a lot of unconventional sounds like children's toys and sounds of nature to create music as well as classical instruments and different genres of music combined. They touch on a lot of subjects that can be quite spiritual and to do with nature but also a lot of innocence from childhood and woman's rights. Cocorosie also touch greatly on the theme of gender and dress in untraditional ways of men and woman even adding facial hair and painting their faces putting a across a message of tolerance and freedom. That we are just being's instead of labels and doing what is more comfortable or spiritual to us regardless of class, race, gender or anything else. Since this project mainly started out from my childhood love and feeling safe in nature I felt some of Cocorosie's work should be included in this research. For instance a video they brought out recently is on the subject of child marriage tells the story of a five year old girl getting married from the child's perspective. And the child only feels safe in nature and has friends that are animals and it's a story about the loss of innocence and trying to find it again in nature so I felt this was a strong resource. Alot darker is a song about love and loss but also has a lot of imagery of forests and trees and has some brief stop motion animation of nature growing and dying. As well lots of contrast imagery of the human body and expressive performance art. This music video is about their upbringing and tells the story of their parents and greatly about the passage of time and loss of childhood. Since the sisters are represented in different stages of their life and the themes of belonging and happiness are shown mostly in childhood. Symbols of nature having powers to cure their mother of illness from a child's perspective with also when your a child prejudice and gender has no meaning. While we were talking about these things it made me feel a lot more positive of the type of influences I could use for this project since these were also bands and subjects that influence my work already. That research and development doesn't have to be so linear towards my project's themes as that is something I've been trying to be a bit more fluid with as an art student. Their is a band I brought up to Louise who I've been into since 2010 and they use a lot of nature especially forests and trees in their work. Their called iamamiwhoami and actually started out on YouTube by putting up very surreal music videos with nature as the theme. The band and their music has all been started virally and funded by their fans to continue the project and videos. The bands mystery by releasing teaser videos and images has made their fan base decide their music's meanings and the band's following. Their a team of artists and performers fore fronted by Swedish singer and performer Jonna Lee which was not known till a later date. They have did installations and performances in forests to fans which creates very beautiful and inspiring imagery forming a relationship with technology and nature. The first video they ever did and that I had forgotten about has the sort of imagery I have been using for this project and is a strong part of research for me to study and recreate in my own ways. Since they are using limbs coming out of trees and using some sort of digital software to manipulate the footage. Many of their videos include trees and the symbolism of birth and growth of them as well as spreading seed's through performance art with installation and the human body. So I will only include a few videos they have done. This video has a lot of images of tree's being inside a home taking the tree from it's natural environment and putting Jonna in a type of greenhouse structure. Almost as if her and the tree have swapped places and identities and she is being born as a tree not a human. A lot of their vidoes are so surreal that interrupting the real meanings behind them is a little tricky but their is for certain that themes of nature and the forest are strong and their videos are telling a story of a being who is closely linked with the natural world. Louise also gave me some great recommendations of other research to look into about our relationship with nature and how important it is to us for our development as well as some of her own findings. One was a book called 'The Nature Principle' by Richard Louv who is a journalist and which includes his views and findings about why nature is so important to our mental and physical well being. Louv has created the term 'Nature deficit disorder' that human beings, especially children, are spending less time outdoors resulting in a wide range of behaviour problems. The disorder is not recognised in any medical science but evidence was compiled and reviewed in 2009 that backed up this theory. "Our society, says Louv, has developed such an outsized faith in technology that we have yet to fully realize or even adequately study how human capacities are enhanced through the power of nature. 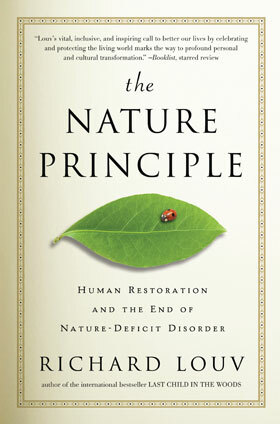 Supported by groundbreaking research, anecdotal evidence, and compelling personal stories, Louv shows us how tapping into the restorative powers of the natural world can boost mental acuity and creativity; promote health and wellness; build smarter and more sustainable businesses, communities, and economies; and ultimately strengthen human bonds. As he says in his introduction, The Nature Principle is "about the power of living in nature—not with it, but in it. We are entering the most creative period in history. The twenty-first century will be the century of human restoration in the natural world." Seems such a fascinating read and seems to explain clearly and show how important nature is and can be to our health and upbringing and why I felt so safe within it as a child. I'll try to obtain a copy of the book soon. This made me think about the nature playgroups that have formed from Germany and in Britain now as well. Which are groups designed to let children play and interact with the natural world. My tutor Pernille mentioned her child has started going to this type of group and I feel that Richard Louv backs up how important this is for child development and my research into this area. Louise also mentioned the BBC 2 drama 'Top of the Lake' and that I should watch it because of the main character being young and escaping into the woods. That it has a lot of great cinematography and that it's good story telling. I've started collecting the episodes but not watched them yet so I'll give them a watch then take some notes for research and see if it's useful. We also briefly and to my delight touched on the Studio Ghibli films and how they use a lot of the natural world and Asian myth to create beautiful animation and environments for their characters to live in. I felt my talk with Louise has been extremely beneficial and I feel more excited and confident about this projects theme and research and with an artist so like minded about the natural world. It's given me a lot stronger research that's related to childhood and nature and what it meant to me which started the project in the first place. A forest to me was a place that was safe and bright with no boundaries or prejudices when I was along as a child which was often. The negative reasons against myself sparked the original idea turning them into a positive.